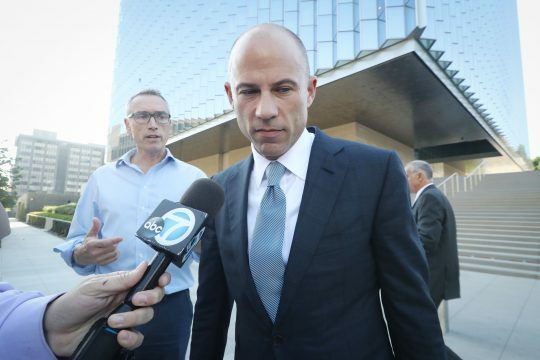 Lawyer Michael Avenatti was arrested Monday on charges in New York and California, the former related to what investigators say was a $20 million effort to extort Nike and the latter for bank and wire fraud. The same day, Avenatti was also charged in California with bank and wire fraud for embezzling money from a client and defrauding a bank with fake tax returns, according to CBS News. And there’s a second federal criminal case against Avenatti. DOJ release: "Federal law enforcement officials will provide details concerning today’s arrest of lawyer Michael Avenatti, who faces federal charges of wire fraud and bank fraud in the Central District of California." News broke of the charges soon after Avenatti tweeted he would be holding a press conference to "disclose a major high school/college basketball scandal perpetrated by @Nike that we have uncovered. This criminal conduct reaches the highest levels of Nike and involves some of the biggest names in college basketball." A cable news favorite last year, Avenatti spoke about possibly running for the White House and said the Democratic National Committee gave him encouragement. MSNBC host Nicolle Wallace said Avenatti "hit a lot of the right notes" in a speech to Iowa while testing the waters on a presidential run. He was arrested in November on suspicions of domestic violence, but he ultimately did not face criminal charges. Daniels and Avenatti parted ways last month, following a public argument where Daniels said Avenatti had filed a defamation lawsuit against Trump without her permission. She ultimately had to pay nearly $300,000 in legal fees over the case. Avenatti has repeatedly predicted Trump will not serve out his full first term, and he also said last year Donald Trump Jr. would be indicted before the year was out. This entry was posted in Politics and tagged Donald Trump, Donald Trump Jr., Michael Avenatti, Stormy Daniels. Bookmark the permalink.